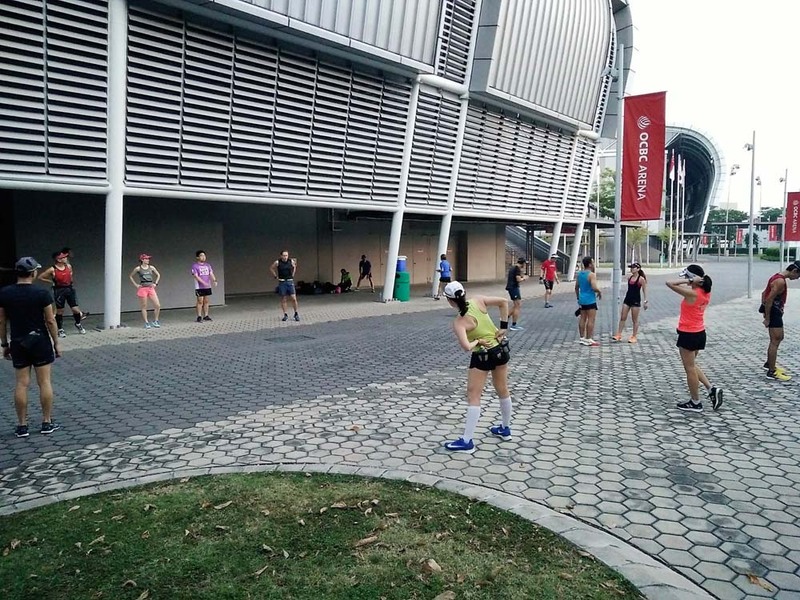 Operation Sunbird 2018, Team FatBird‘s 12-week marathon training program for Standard Chartered Singapore Marathon (SCSM), kicked off at the OCBC Arena in great weather. A good flock of runners, many new trainees and as many returning ones, arrived early to the training ground in anticipation of the solid marathon training that will help them achieve their SCSM and racing weight goals. A welcome briefing was conducted to explain the structure of training as well as to place trainees in different training groups, led by respective trainers, according to their running background, capabilities, training goals. 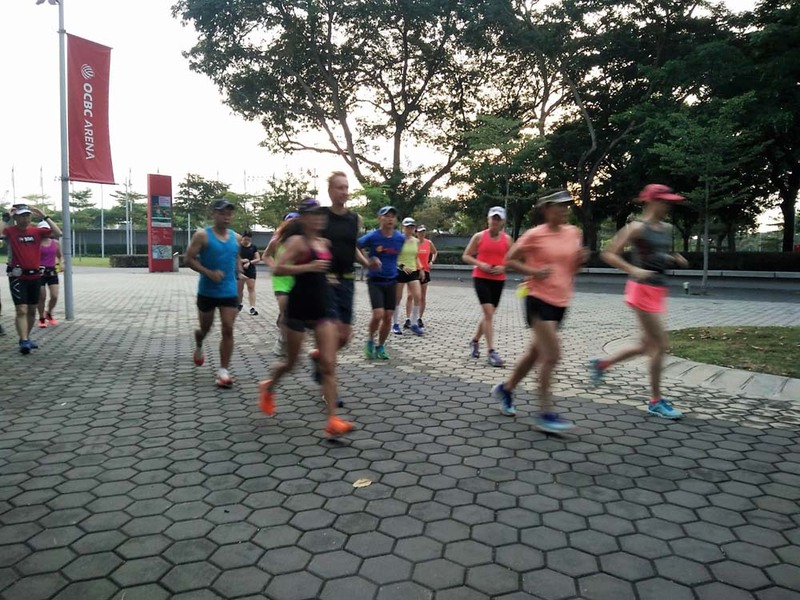 The weather was cloudy and cool, just perfect for the first long run for all Sunbirds to get on the right footing. 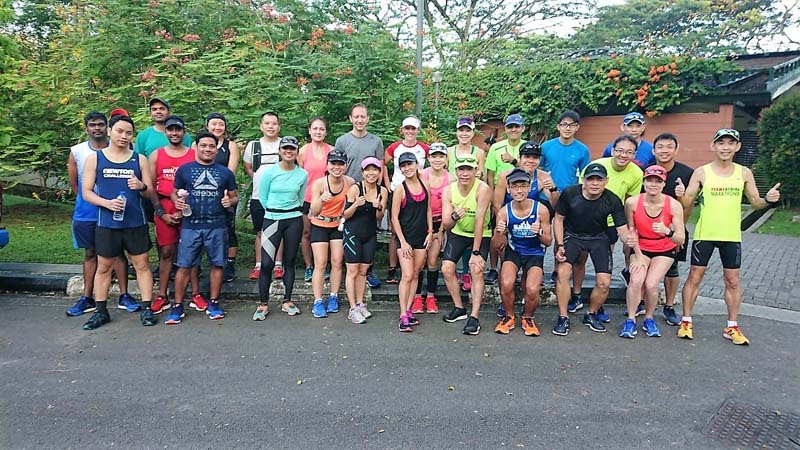 The first 4 weeks of training will focus on building up of a good aerobic base for these runners as a foundation for more intensive work in subsequent phases of training. 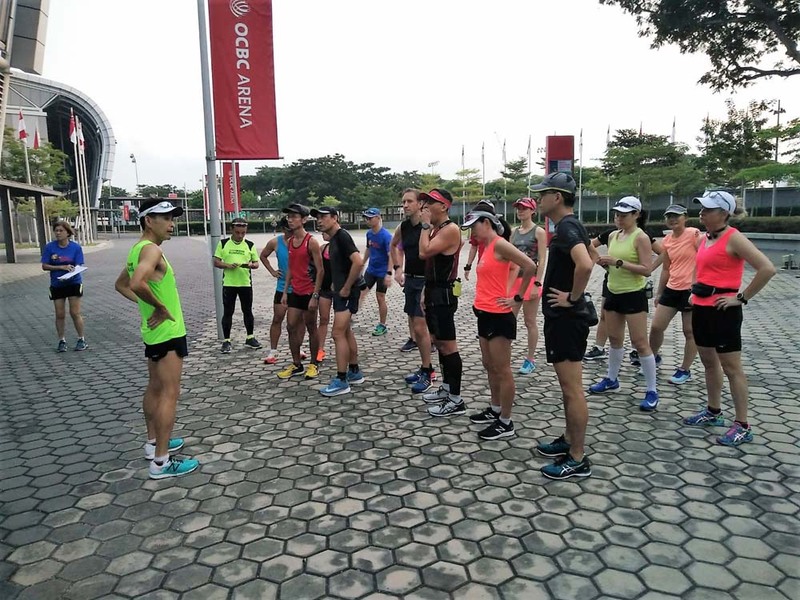 Today’s long run of 100min (13km) and 130min (21km) was conducted at BaseBuild pace along the scenic routes of Gardens By The Bay, Marina Bay Sands, East Coast Parkway. 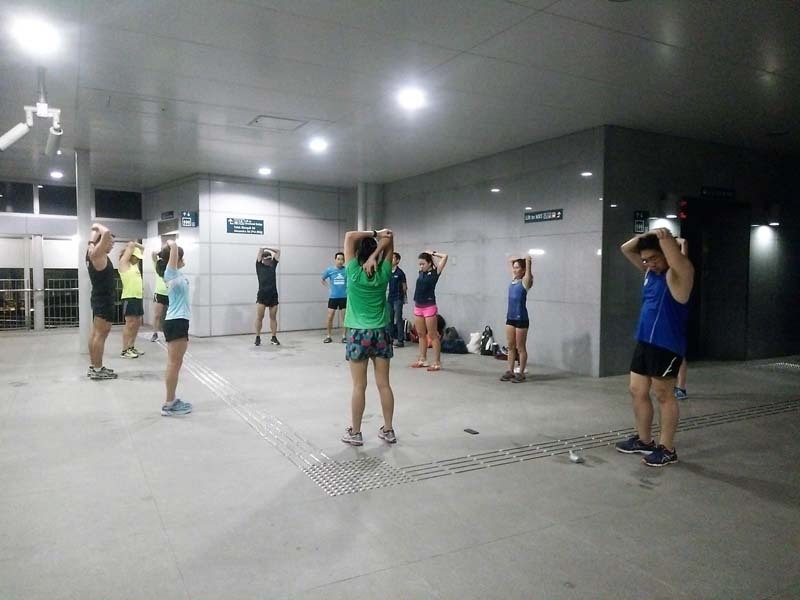 Led by experienced FatBird Marathon trainers, the trainees were guided on managing their effort and pace, with tips on maintaining good running form during their 1.5-2 hour workout. Training completed right on target at 9:45am with the successful execution of the first long run in training by all Sunbirds. 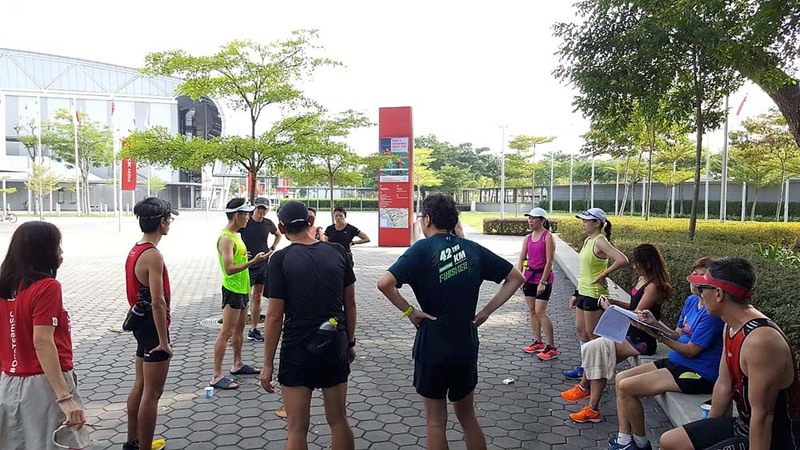 A post-run debrief was conducted to share and explain the progress of training, proper running techniques, hydration needs as well as injury-free running tips. These weekend long runs will progressively be increased in volume (time/distance) and intensity as training advances into the next phases. Ops Sunbird Week #1 ended on a high note with a smooth kickoff well attended by participants. 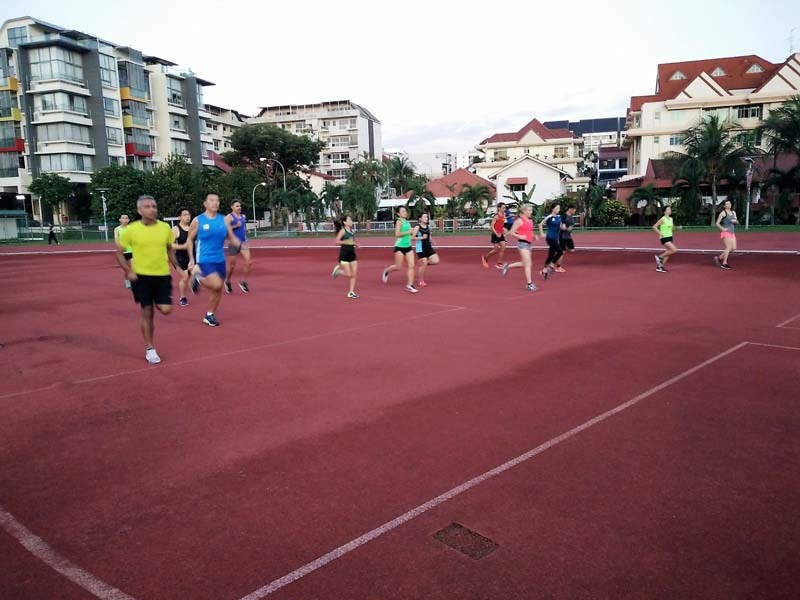 This sets the stage for progressive workouts of basebuilding and pace training in the following weeks to strengthen the marathon abilities of all Sunbirds. 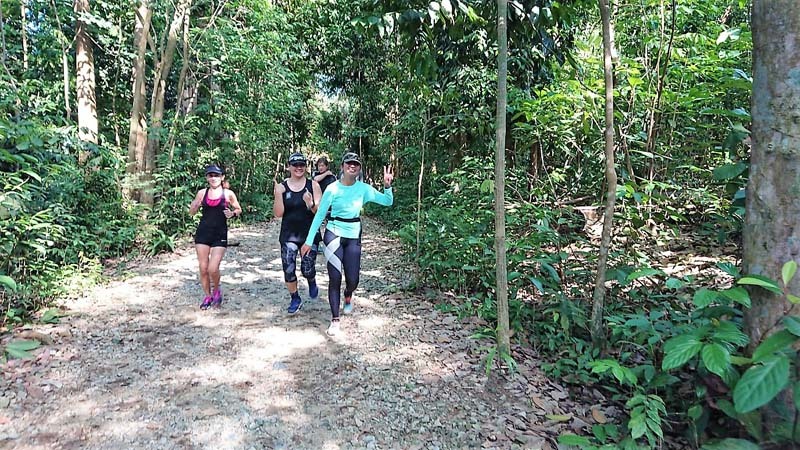 All Sunbirds now look forward to Week #2 where we will be going on to some trails & hills for their long run at MacRitchie Reservoir Park. 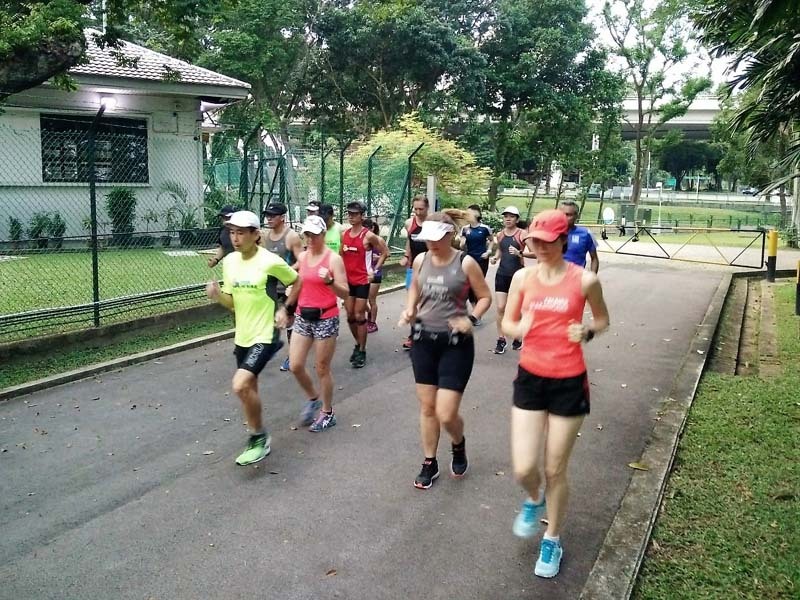 We look forward to seeing those who did not managed to come for this first training session at the next run, as well as urging more runners to join us for our tried and tested marathon training program. The Sunbirds Kicked Off SCSM Training With Flying Colours! 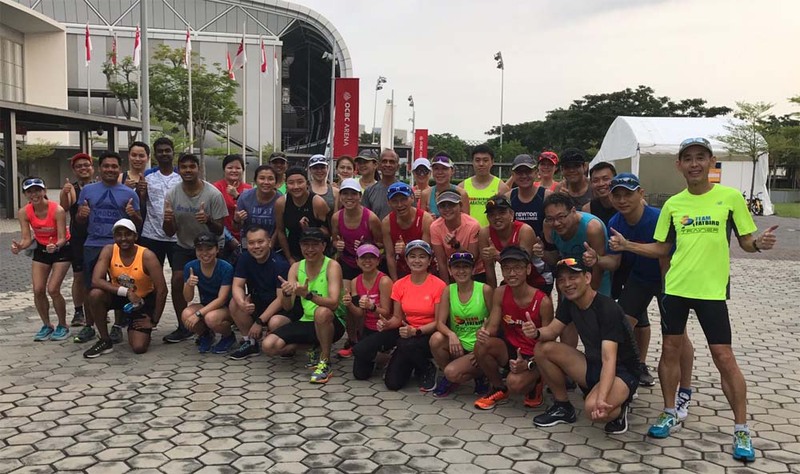 The 12-week PowerFLIGHT Speed & Strength marathon training prepared our runners well for the Army Half Marathon 2018 (AHM18). 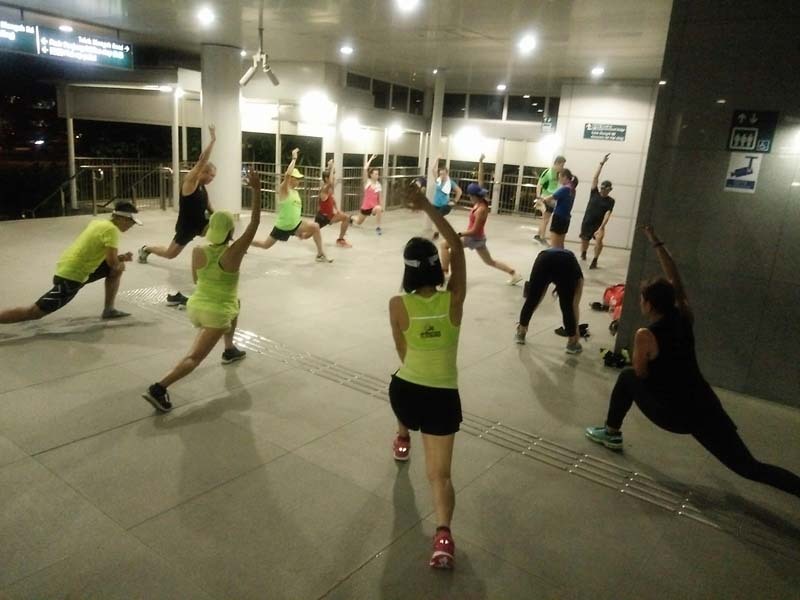 Because of the Singapore heat, the AHM18 has been having a very early start at 4:30am every year. Considering my sleeping habits (which is quite late in the night), I could not get into sleep at all in spite of lying in bed from 10pm. I decided to watch some YouTube instead while waiting for breakfast time at 2:30am. Eddie has so kindly volunteered to pick us up at 3:00am to proceed to our group’s meet-up at Esplanade Amphitheatre. 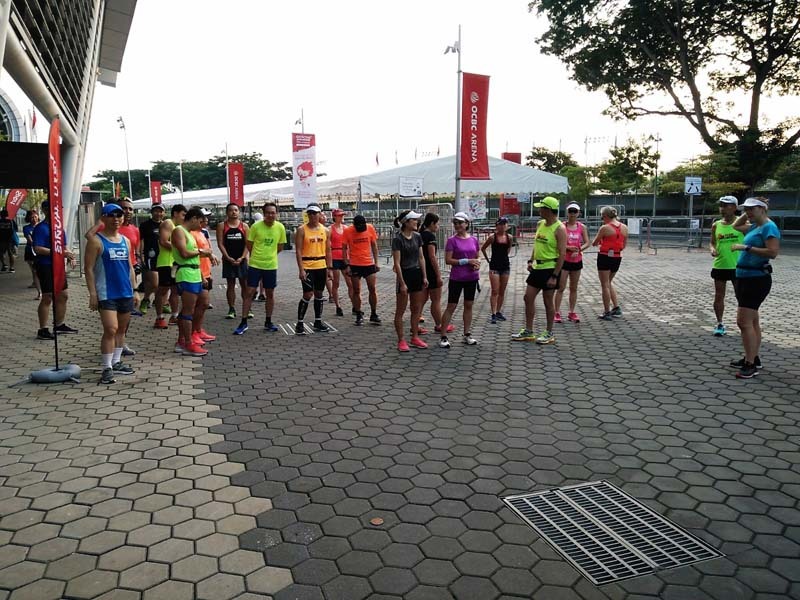 We did our warm-up routing of light jogging, activation drills and some strides before more of our runners arrive. After our group photo and final toilet stop, we proceeded into the start corral at 4:00am and inched our way closer to the front for a smooth start. 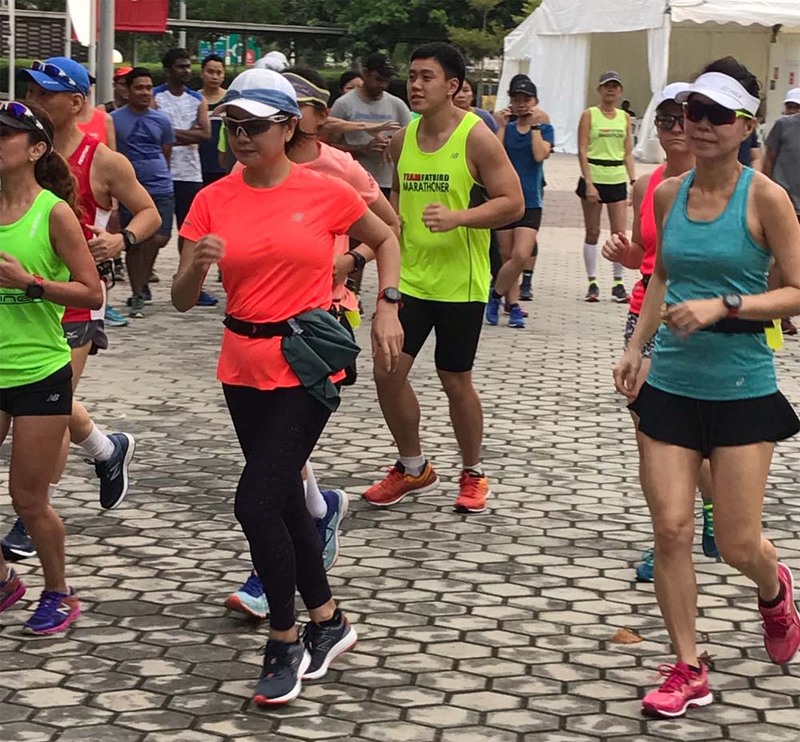 Armed with our respective race and pace plans, the PowerFLIGHT marathoners were all raring to get out there for a good run. The weather conditions were kind with not too much humidity in the air. The COA promptly started the Half Marathon race at 4:33am. After a slight initial crowd at the front, I was able to find space to move closer to the front. 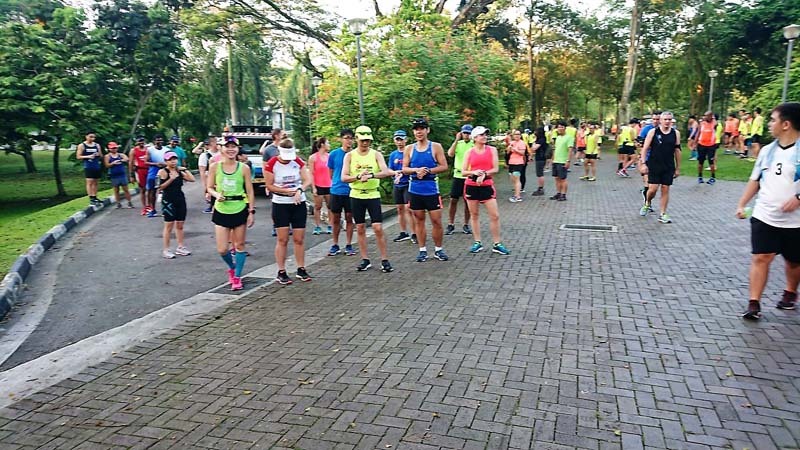 Met many fellow FatBird, SAFRA runners and friends along the 1st km. We exchanged greetings and well wishes before proceeding onwards to our targets. 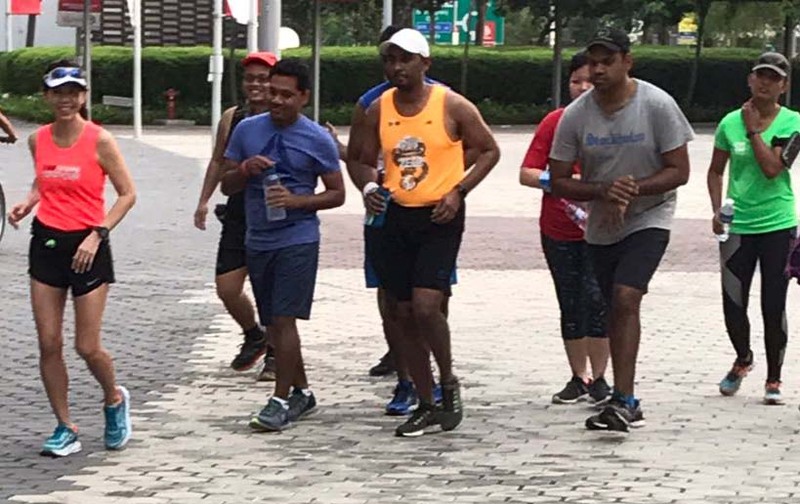 The first 5km was along the CBD area where GPS signals were affected by the tall buildings. Pace readings would be off and running by Heart Rate and Rate Of Perceived Exertion (RPE) was best here. Taking care not to elevate HR, I would keeping to a comfortable hard effort and staying with the pack who were running 4:30+ pace. My target for this race was to run a 4:30 pace average for the whole 21.1km. Was a little surprised to find the first 2 water stations without isotonic, but no big deal. The following 5km brought us through the Gardens which was well lit and having good directional signs to point us for turns ahead. 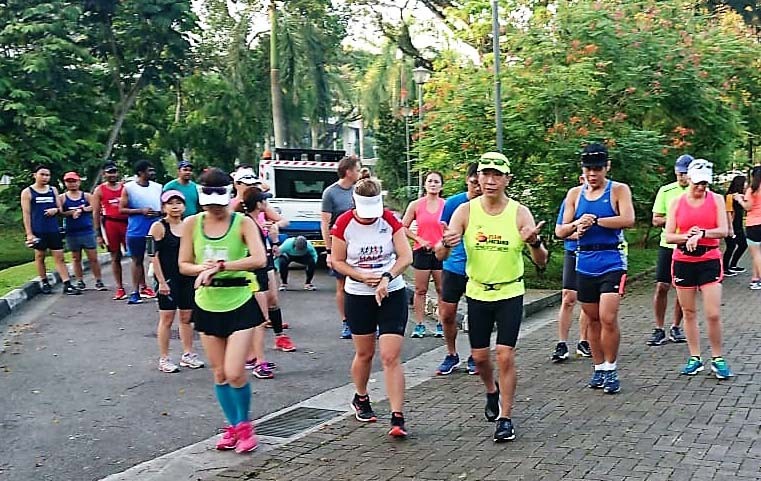 I tried to maintain 4:30 pace without feeling too worked up from there before we entered the ECP at about the 12km mark. Missed the drinks but managed to grab a banana at the final table for a small bite to get some carbs in. 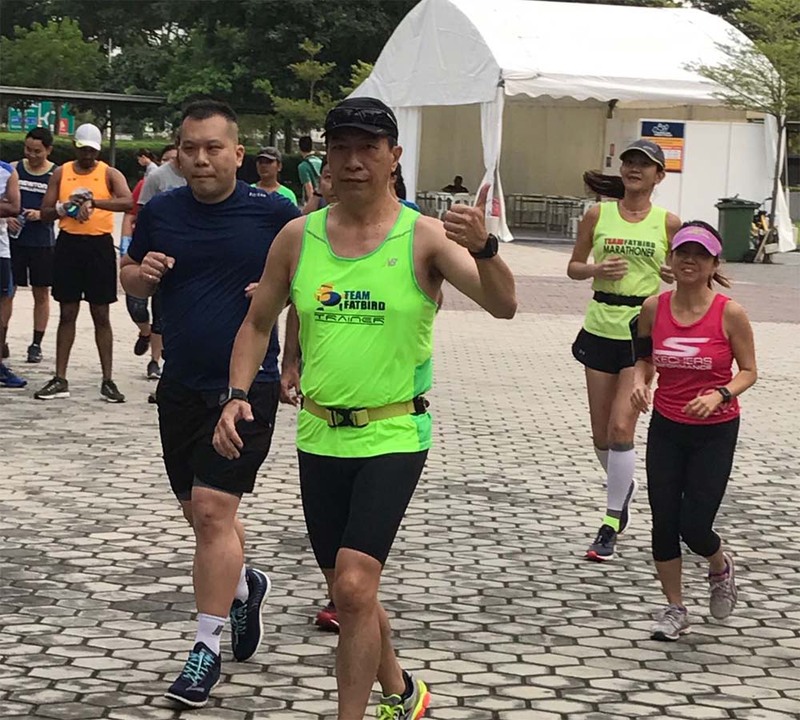 I was still feeling comfortable as I overtook a number of tiring runners through ECP, Sports Hub before coming out onto Mountbatten / Nicholl Highway stretch for the final 7km. I decided to consume the lone pack of gel at 15km to get rid of the jiggle in my pocket. The run along Nicholl Highway was enjoyable because of the space and some light wind in the face. I continued to maintain 4:30 pace and overtook a few more folks. 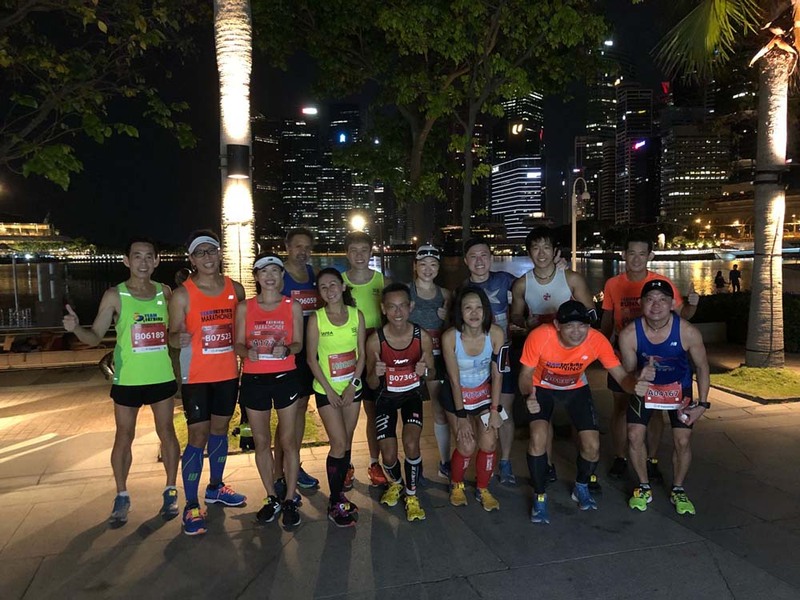 In between, there were also some good exchanges of fellow runners trading places. That made it interesting in what would be otherwise just plain focusing on closing in to the finish line. 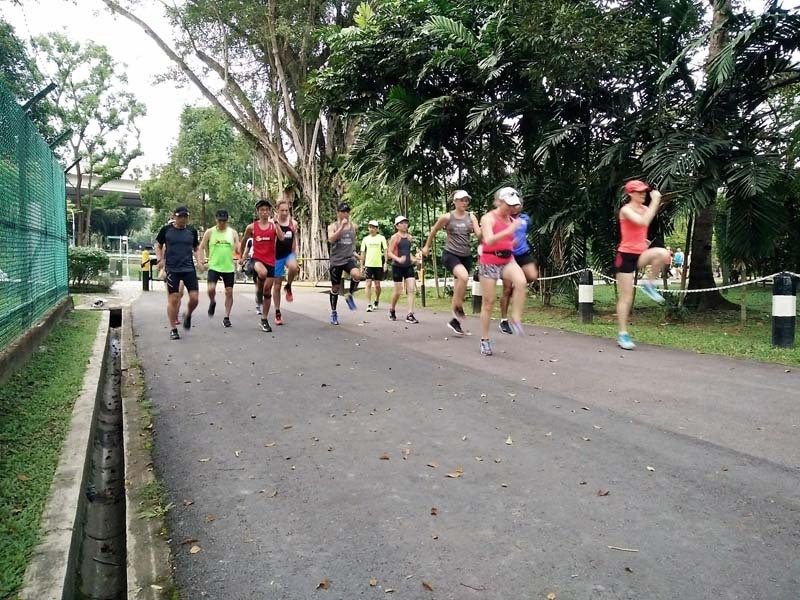 As I headed towards Esplanade with 3-4km to go, the strain of keeping 4:30 pace could be felt. Needed to perk up to maintain good running form and smoother breathing to avoid slowing down too much. There were no niggles, twitches or any signs of cramping up, which was nice. 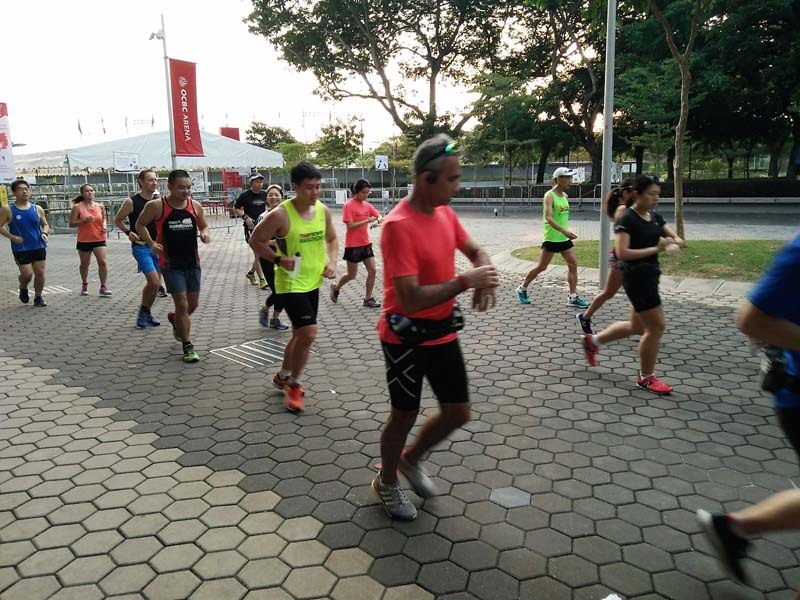 We ran on the outside of Esplanade instead of through F1 Pit area and soon I could see the final stretch of 1km at the Esplanade Bridge area. 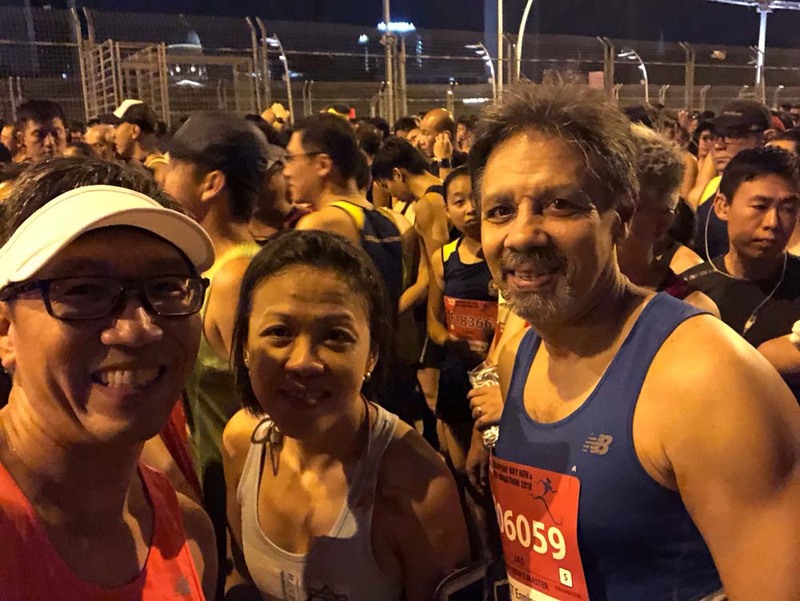 I was doing a final calculation if I could achieve my Half Marathon PB of 1:35:15 and before I knew it, I was striding down the final 200m to the finish line. The clock displayed 1:35 and some change. I was happy to find out later that I ran a nett time of 1:34:16 on a accurate HM route for a new Personal Best. Before I could take a breather at the finish line, I saw Pua and few others, and then Vanessa from SPRC coming in with a podium tag. Then Chee Peng came in at 1:36 with a massive PB. Waited a bit for Eddie who did a massive PB of 1:40 and then saw Steven with PB at 1:39 and KS coming in at 1:43. 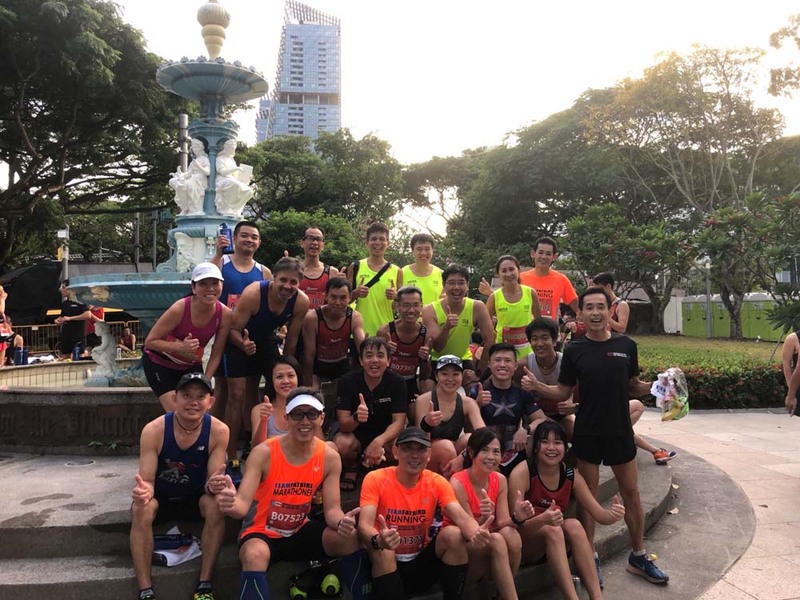 We proceeded on to collect our finisher tee and medals before meeting up with the FatBirds and PowerFLIGHT marathoners at Tan Kim Seng Fountain. Bumped into Raymond who did extremely well with 1:28 for podium, Robin with solid PB of 1:31. 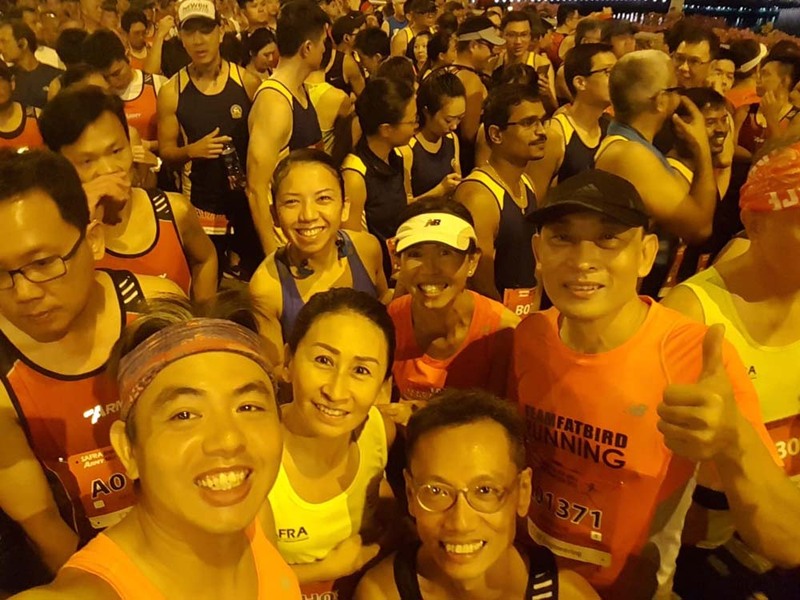 I was excited and elated by the outstanding results achieved by our trainees and runners as they returned from the race with HM PBs in the order of 5-25min quantum. 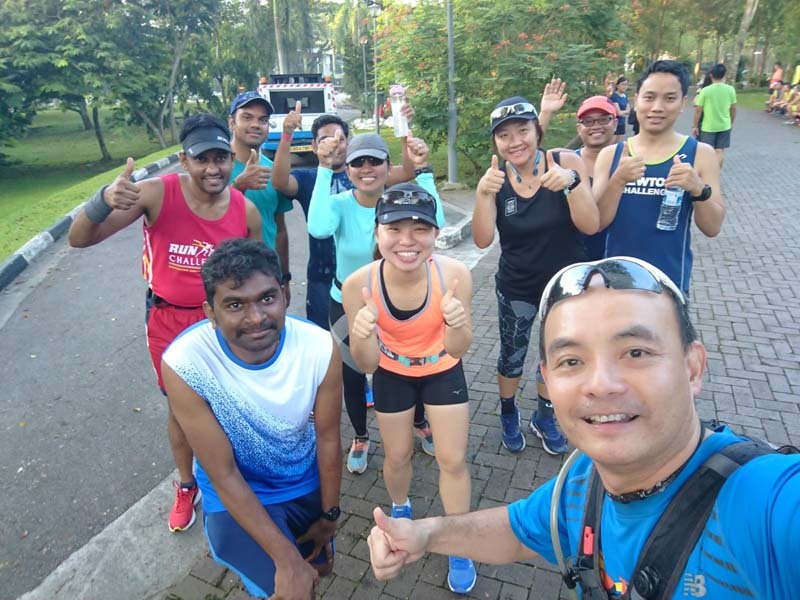 All the dedication, commitment, belief in the training plan coupled with solid execution of race plans have delivered the sweet rewards for these happy campers. 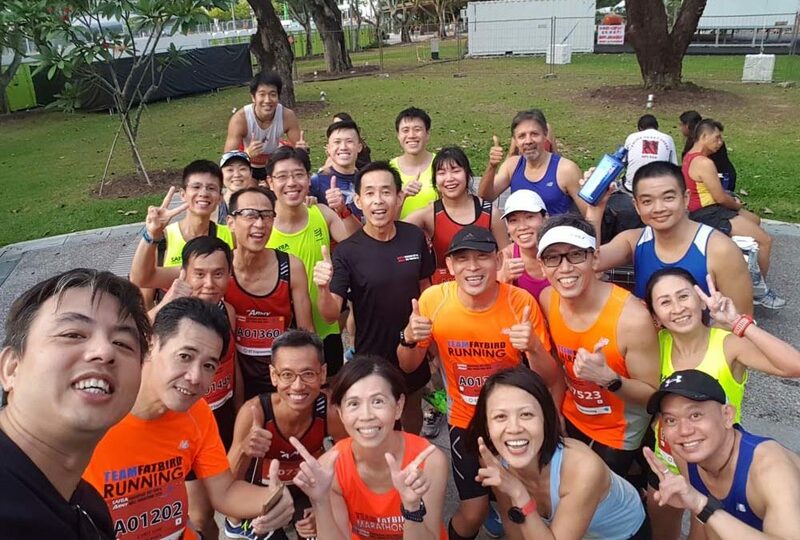 Heartiest Congratulations to Julie, Xueli, David, Eddie, Meng See, Paul, Lynn, Winston, Nelson, Roslyn, Josephine, Jasvinder, Chee Peng, Beverly, Jacqueline, Rand, Chris and many more which I have unintentionally missed here for your outstanding performances and well-deserving Personal Bests at the AHM18. You PowerFLIGHTers Rocked With Power! 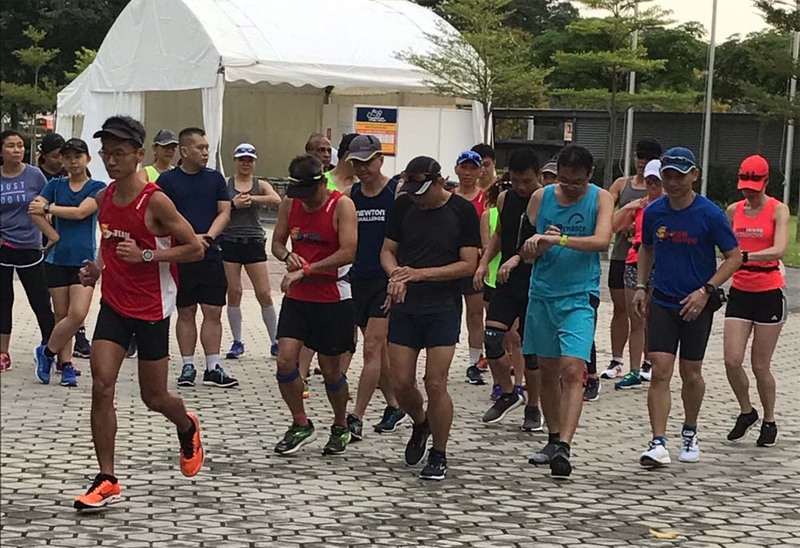 Kudos and shout out to the highly dependable Army and SAFRA organization for putting such a class act with a superbly well-organized race scoring high points in all important areas of race experience and logistics management. Well Done AHM Organizers! We will now take our well-deserved break and do some reflection and assessment of our training and preparations for the AHM. 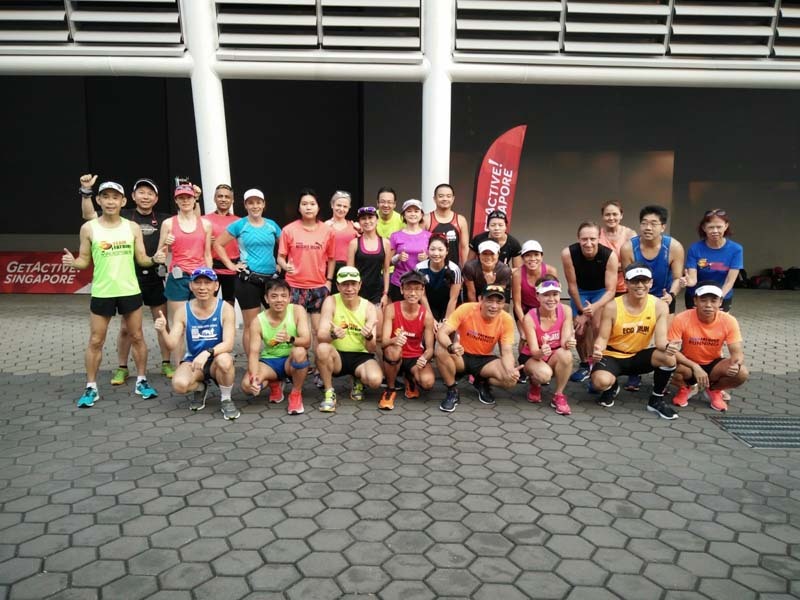 We will bring the lessons and build on this good momentum into our 12-week structured training for the Singapore Marathon (SCSM) in a few weeks. 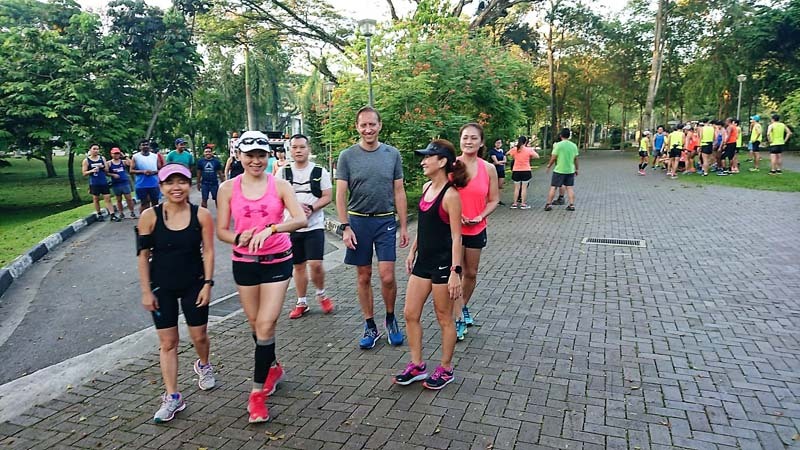 Meanwhile, I will be indulging in my favourite foods and maybe put on 2-3kg before continuing with my preparations for New York Marathon in the first week of November. 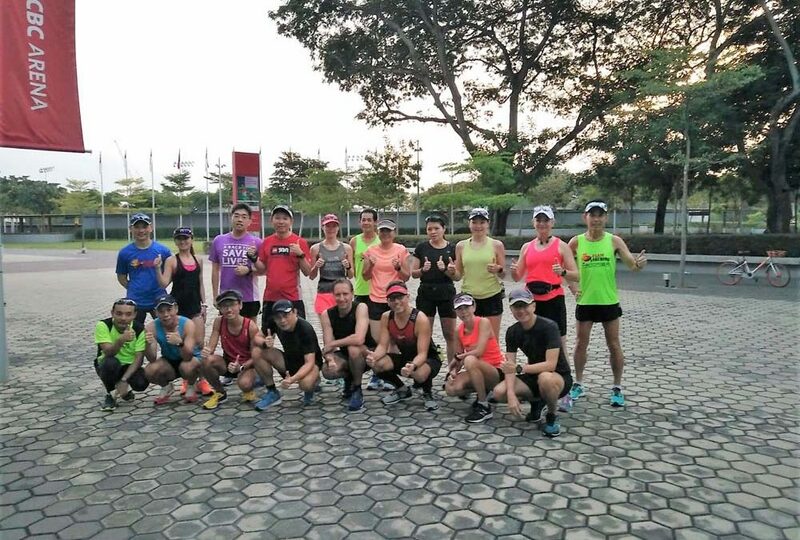 With barely 3 weeks to AHM, the Program PowerFLIGHT trainees are peaking well with more intensive workouts after a strong base of strength and speed has been established. 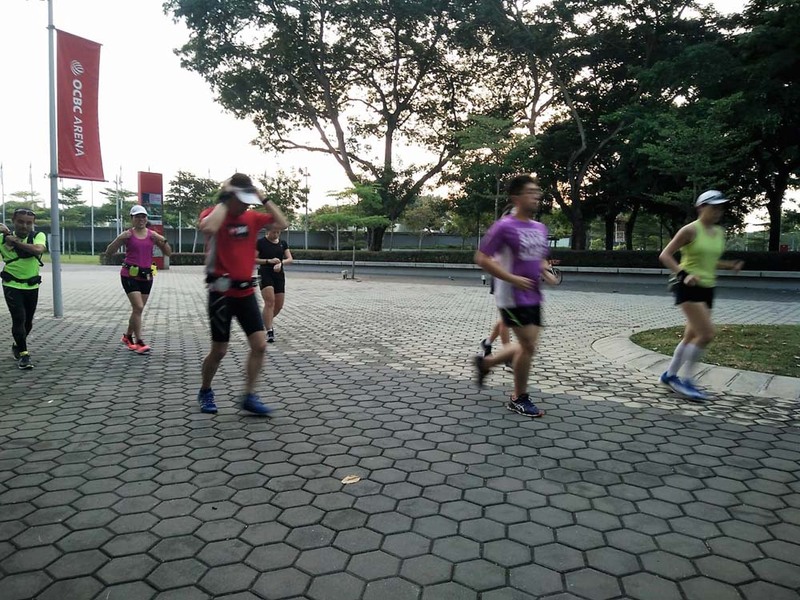 The speedwork of VO2Max and Tempo intervals have honed the PowerFLIGHTers’ sense of pacing and endurance for fast running. 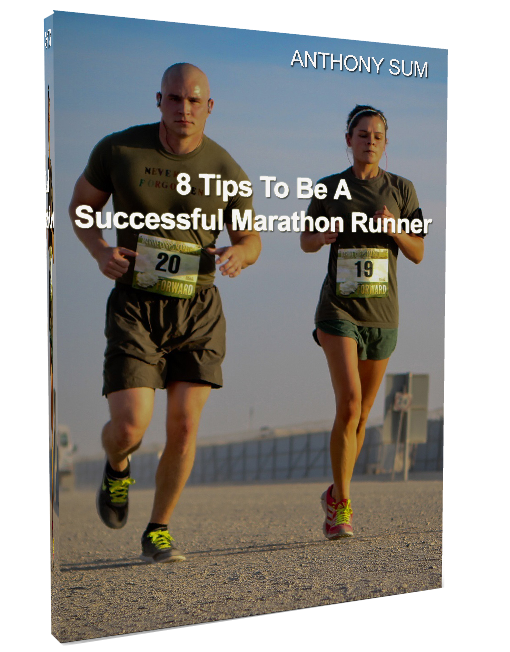 This will serve to enhance their aerobic strength which will allow them to sustain goal pace through the whole HM distance. 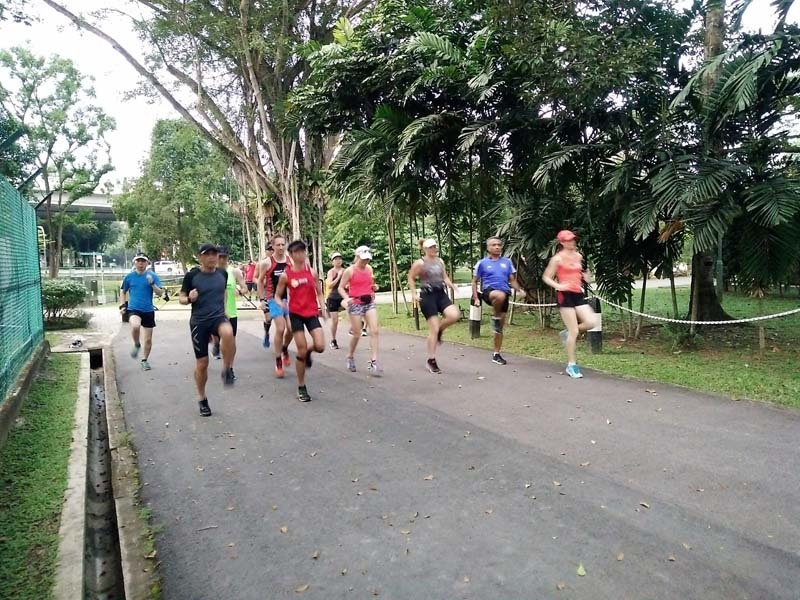 Regular sessions of strides have been incorporated into their long run workouts to give those faster-twitch muscles a workout as well as gearing up their range of motion and good running form. The long hills runs and repetitions have been thoroughly enjoyed by the PowerFLIGHTers. 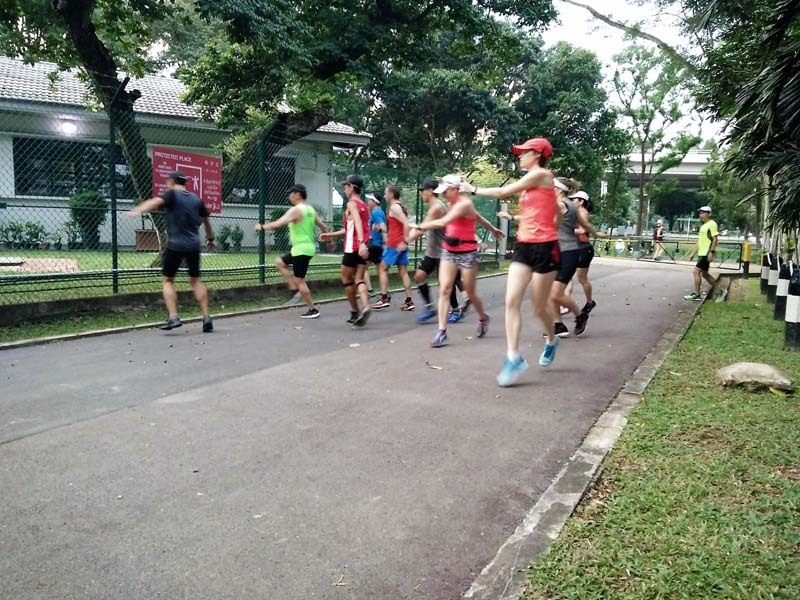 A good thing as those hillswork with strengthen their running legs and establish better running form, going towards enhancing their racing speed for race day. 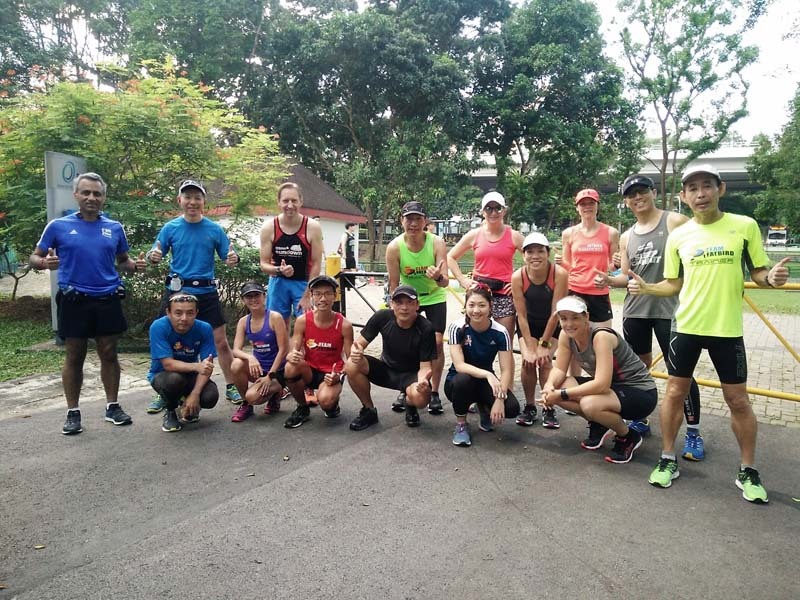 A few trail sessions have been injected into the comprehensive training program to strengthen the ankles and feet of the runners, as well as heightened their sense of balance, agility and mobility in uneven terrain. When it comes time to race on the roads, the PowerFLIGHTers will be able to manage faster running speeds on a strong and stable platform. With 3/4 of PowerFLIGHT training completed, the PowerFLIGHTers are certainly doing much better in all running departments at the track, hills and roads. 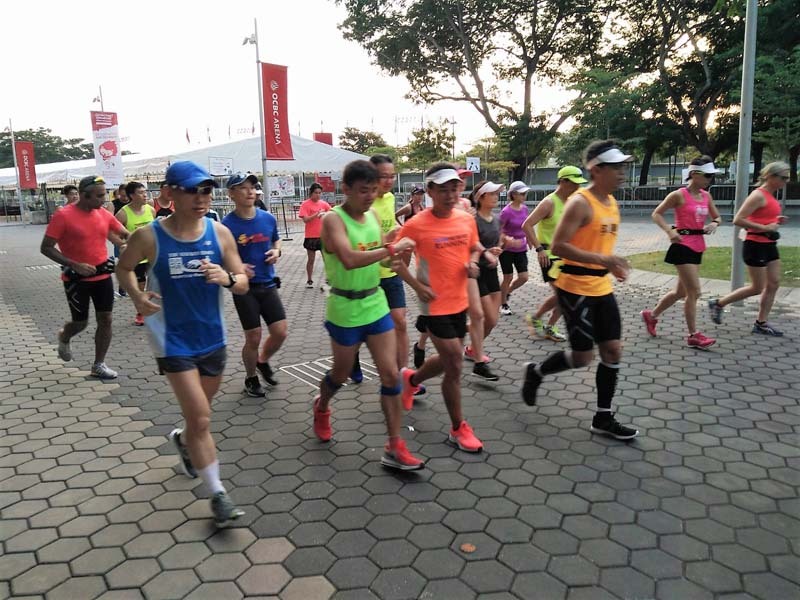 As we hone in on the final preparations in the next few weeks with more targeted workouts to sharpen their race readiness, the trainers are quietly confident that the PowerFLIGHTers will do very well at the AHM 2018. The main consideration is to have planned rest and recovery to avoid any unwanted injuries cropping up at this crucial period. 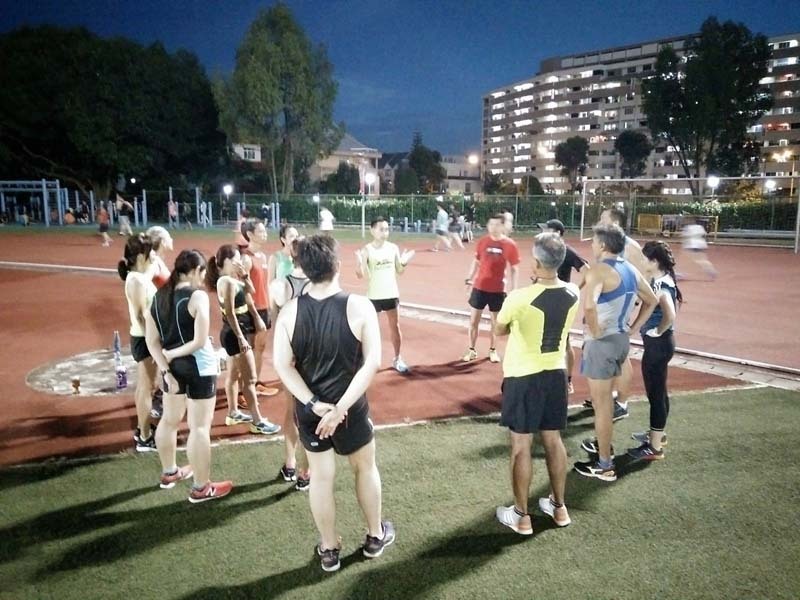 We will be back to the track for interval training followed by a weekend of Long Tempo Run in week #10. The PowerFLIGHTers are peaking strong!